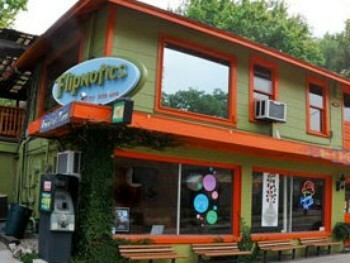 A few nights ago I was quaffing a pint at a Barton Springs Road eatery and looked across the street to see a violin player framed in the upstairs window of Flipnotics, my favorite coffee shop. Like a silent, erupting volcano he heaved up and down behind the glass in his red flannel shirt, attacking the strings under Flip’s stage lighting. My imagination concocted a fiddle melody and layered it onto the sound of clinking glasses and conversations that wafted my way in the restaurant. It had been only that morning when I scribbled notes onto a sheet of paper in the same room where the volcano fiddler was now cutting loose. My geographical range of entertainment may sound limited, but what can I say? When you find a corner of town that reeks with friendly energy, hang out there. The notes I scribbled that morning at the Flipnotics table were my initial attempts at pulling together my second novel. I started going to Flipnotics about ten years ago. 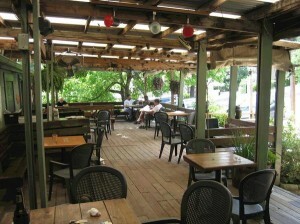 It’s one of the few places in the city with an outside deck that’s not jammed up against a busy parking lot or street. Sure, the parking lot may skirt the main deck, but the dominant landscape feature is the overgrown hillside with the other, ascending decks. I think I wrote parts of my first novel, Church of the God Particle, at every one of those deck tables. When it rains, water off the hillside trickles in rivulets past the decks, eventually spreading across the street on the other side of the building. Long after the rain stops, you can still hear the sound of car tires splashing over the pavement. Biking the long, steep Kinney Avenue hill keeps me in shape (sort of). When I visit Flip’s in the morning for coffee and a snack, I hurtle down the hill and veer into the parking lot. Of course, the workout comes on the return trip, especially if it’s in the evening and includes beer. Everyone at Flip’s seems to have their hands on a laptop, tablet, or smart phone, but folks that carry on long business conversations (as if the place were an office building) don’t last very long. I suppose the annoyed glances eventually usher them out. I’ve hauled my laptop to Flip’s, but I usually prefer a pen and paper when I’m just popping in to jot down a few thoughts. Sipping coffee and reading the weekly edition of the Chronicle soothes away the day’s strains. One of the characters in my novel, Quizzy Shatterling, is an investigative reporter for an Austin weekly publication. While Quizzy contemplates how not to get killed over a story she is unearthing, she drinks a beer near Flip’s and plots a counterstrike against her nemesis: a nasty preacher. No blog post about Flipnotics could ever be credible without mentioning the eclectic staff who have kept the place running at such an even temperament for so many years. I remember the morning I sat at a corner table while people, dogs, and grackles came and went from the main deck. A group of unruly passers-through were getting out of hand on the top deck, and one of staff climbed the steps without hesitation. He matter-of-factly asked them to tone it down. No threats of calling the cops and no attitude. Just the facts, ma’am. The partiers seemed to respect that. They still had plenty of celebratory spirit in them, so they left– but they didn’t leave angry. Each of staff seems to have useful expertise about one thing or another: literature, art, politics, bicycling, food/drink, rowdy patron management, and a lot more. Plus they have the ability to just get along and treat everybody right who comes into the place looking for something unique. I’m optimistic that Flipnotics will withstand the pressure of development that’s coursing through that neighborhood these days. I say that based on the venue’s small, steep footprint that’s squeezed in below the houses on top of the hill. Flip’s is truly an Austin icon, and the kids who are now wheeled in on tricycles deserve to have their childhood hangout grow old with them.